Be careful with the harissa. Not only do samples vary enormously in strength, but also be aware that some jars that bear the name are not really harissa, but a paste made red with beetroot and carrot. 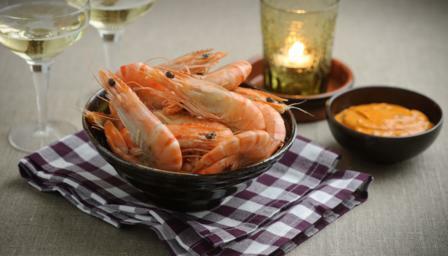 Place all the ingredients except the prawns into a bowl and mix well, then transfer to a small dipping bowl. Place the prawns on a large plate for people to peel and dip into the sauce.